Learning how to be successful in a public relations (PR) agency is a stressful on-the-job, sink-or-swim, immersive experience. While other texts teach PR theory and practice, no other book guides early to mid-career PR professionals through the day-to-day life of working in an agency and the skills required to excel and build a career. This text demystifies the PR agency experience with foundational information to simplify and clarify agency life. Authors Kristin Johnson and Shalon Roth, who each grew successful careers in PR agencies, share secrets that no one will teach in a class or a seminar. This is real talk about real life in an agency – punctuated by anecdotes from leaders in the industry. 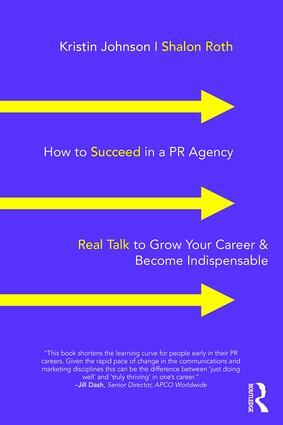 This is a must-read for communications students and PR professionals looking to grow their career and become indispensable to teams and clients.